I have previously attended the National Rifle Association annual meeting twice. Exhibitors and attendees at that show are not very diverse. In my estimation, the National Shooting Sports Foundation’s Shooting, Hunting and Outdoor Trade (SHOT) Show is even less diverse. Waiting to enter SHOT Show exhibit hall. Photo courtesy of National Shooting Sports Foundation. The faces in the crowd in the picture above and every other picture I have from the show reflect the statistical reality that the average gun owner in America is a middle-aged white male. Not that there’s anything wrong with that, per se, but one of the promises of Gun Culture 2.0 is that it will better reflect the diversity of the American population. The massive photo on the back of the Glock booth at the SHOT Show is definitely aspirational. This was my first SHOT Show, so I don’t have any historical perspective, but I saw more women in professional shooter jerseys or covering the event as media than I did “booth bunnies” (though there were still some of those). I would count that as progress based on what I have heard about previous SHOT Shows. I also attended a seminar on how companies can leverage their brand ambassadors that featured two female professional shooters, Diana Muller and Gabby Franco. Although I did not see Colion Noir, the NRA’s designated black commentator, he was apparently at the SHOT Show. I did, however, attend a seminar called “Evolve or Die: Engaging Urban Communities in the 2A Fight” featuring Maj Toure, founder of Black Guns Matter. I counted about 90 attending Toure’s seminar, overwhelmingly white people. 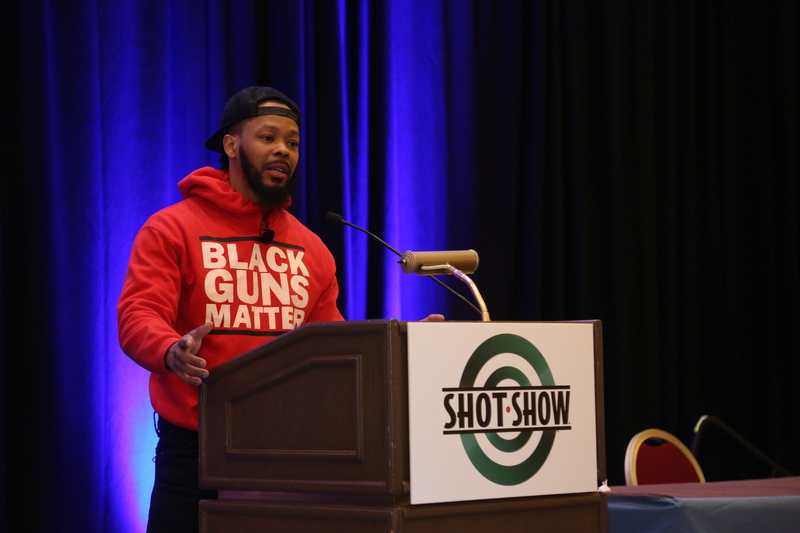 Toure alternated between a reading the text of a PowerPoint presentation on the concept of evolution applied to gun culture, and a freestyle interaction with the audience. He was much more in his element doing the latter, but the net result of his alternating back and forth was some lack of clarity on the promised topic of evolution and engaging urban communities. In my view, his talk boiled down to a couple of key challenges to gun culture: “What are you doing to engage people outside your bubble?” And support companies that support outreach into urban communities, even if you just want to make more money because you need new customers. Kudos to the NSSF for giving Toure a platform to begin a dialogue about diversifying gun culture. It’s unfortunate, then, that the same NSSF was selling a SHOT Show branded t-shirt in its show store that threw shade on the professional athletes kneeling during the national anthem to bring attention to the issue of police brutality and racism. Among the issues that Maj Toure said gun culture was slow to evolve on: inner city police violence. Why the NSSF felt it necessary to wade into that culture war, I have no idea. I thought that was what the NRA was for? Why not just stick to the more inclusive message found on another t-shirt: I just want to drink coffee and shoot guns. Tags: Black Guns Matter, Diana Muller, Gabby Franco, Glock, guns and race, Maj Toure, National Shooting Sports Foundation, SHOT Show, women. Bookmark the permalink. I was interviewed on Saturday by a reporter for our NPR affiliate at the Univ. of New Mexico, KUNM. The gist of it was “we want to interview a weird gun owner, i.e., someone whose politics would not make you think he was a gun owner”. Had to laugh. Stay tuned. A local subunit of the MSM Khal? And I personally have no problem with anyone joining us as long as there not a criminal and are not crazy and use firearms safely. Wonderful post. 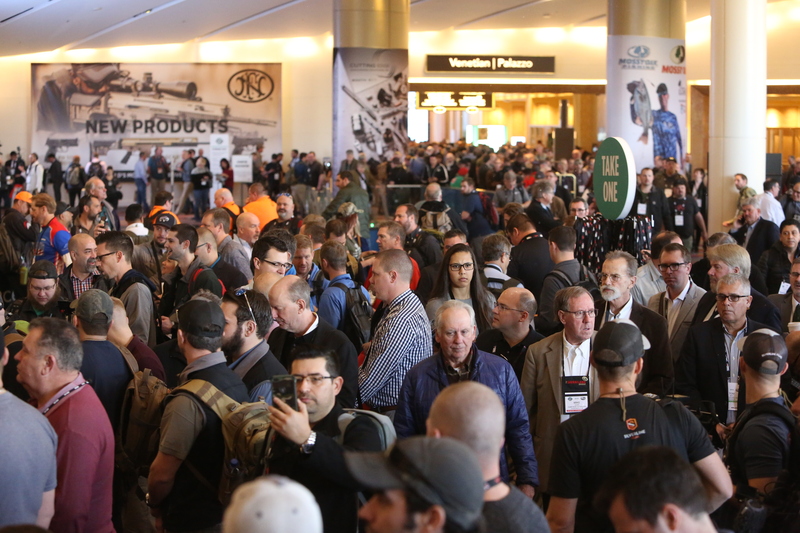 Interesting that SHOT show and many of the larger industry events are still attended largely by white males. To underline your notion of Gun Culture 2.0, the majority of attendees at gun ranges in Southern California are non-white on the weekends. I feel that movies and music can tend to drive a wedge between many ethnic and social groups in So Cal, but everyone at the range is more than happy to help one another and chat about what they’re firing. Thanks for taking the time to comment. Glad to hear your experiences differ. Finding a common ground with people who differ from us in other ways is a great way to build bridges. Gun nuttery seems to transcend a lot of cultural differences.